Robert P. Walker was born in Beaufort, Missouri on October 24, 1927, later moving to Dixon, Missouri, where he graduated from Crocker High School in 1944. He attended the United States Merchant Marine Academy at Kings Point, New York, where he graduated with a Bachelor of Science Degree in 1948. Grand Master Walker later attended Columbia Graduate School of Business and received his Master of Business Administration from New York University in 1957. In addition, he has received a Doctor of Jurisprudence Degree from New York University School of Law in 1962, and to add a touch of Texas to his pursuit of higher learning, he has completed all course work toward a Master of Arts Degree at Sam Houston State University and he has also attended Lamar University. While a cadet at the Merchant Marine Academy, Grand Master Walker met another cadet’s date. Following his graduation from the Academy and a year at sea with the Texaco Fleet, he and Kathleen Nowicke were married on August 18, 1949. They have three sons; Robert, Paul and Timothy and are the proud grandparents of six grandchildren. The Walkers are members of St. John American Lutheran Church where Grand Master Walker has served as President of the Church Council. A firm believer that a well rounded life includes community involvement, he has served in various positions with Boy Scouts of America and has served as councilman and Mayor pro tem for the City of Port Arthur; the Port Arthur Historical Society; the American Red Cross; Port Arthur Chamber of Commerce and the Texas Maritime Society. Grand Master Walker was employed by the Texaco Marine Department between 1948 and 1966 as Ship’s Captain, Fleet Superintendent and Manager of Personnel. From 1966 to 1971 he served as manager, U.S. Fleet, Texaco Marine Department. In addition to being licensed to practice law, he is a licensed Master of Vessels of any gross tonnage for sailing all oceans and seas. It was his employment with Texaco which brought him to Texas in November, 1963. From 1971 to 1982, Grand Master Walker worked as a Practicing Attorney and also served as a Municipal Judge. Since 1982, he has served as a Judge of the 279th District Court in Jefferson County, Texas. 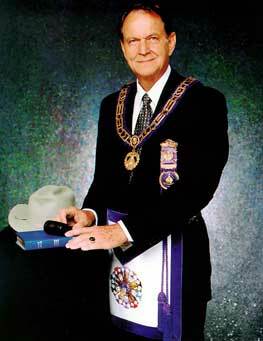 He completed his degrees of Craft Masonry on May 10, 1954 in Cosmopolitan Lodge No.872, and later served as Worshipful Master of that Lodge and as President of the Masters, Wardens and Secretaries Association of the 26th Masonic Districts. His leadership and dedication to Freemasonry was recognized by his Lodge which honored him as a recipient of the Golden Trowel Award. Thus began Robert Paul Walker’s climb of the fraternal ladder which has brought him to the top rung, there to have the purple of our fraternity placed upon his honored shoulders.